One of the most photographed views in Calasparra is that of the rice fields which fringe the River Segura, startling green belts of vivid colour during the late spring, producing a distinctive rounded rice which is prized for rice dishes across Spain. Rice is the staple diet of local residents and is used with a wide variety of ingredients for both sweet and savoury rice dishes, so sampling the local gastronomy in one of the town´s restaurants, as well as purchasing a bag of plump Calasparra rice to take home are both mandatory when visiting Calasparra. There is also a little Museum dedicated to rice production, next to the tourist office, which in itself is homed within a former rice store. 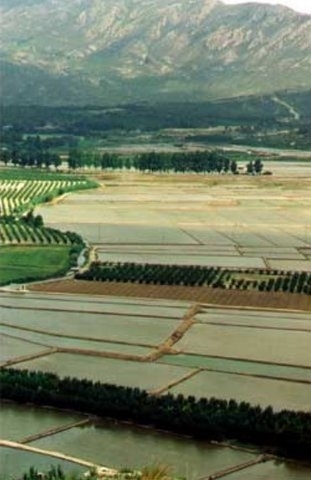 The rice-growing area of Calasparra, which includes the fields in El Salmerón, covers a total area of approximately 875 hectares. This floodland occupies fields on either bank of the River Segura in the Vega Alta. Rice is the second most widely grown cereal crop in the world, after wheat: in 2009 annual worldwide production was over 678 million tons, more than 90% of which was grown in Asia. Spanish rice production accounts for just 0.1% of that worldwide total, with the fields of Calasparra yielding a figure of just 2,500 tons per year. Biologically grown rice from this area is widely exported, and represents 15% of the total production, 75% of it travelling to countries such as Belgium, Germany, Switzerland, Greece, Israel, Australia, New Zealand, Singapore, USA, etc. History of rice production in Calasparra. The history of rice cultivation goes back around 5,000 years, the first evidence of it forming part of human activity being found in southern India. From there it spread to China and Indochina in the east, and Persia and Egypt to the west. It was brought to the Mediterranean by the Arabs, and reached Spain when the Moors colonized and occupied much of the Iberian peninsula, between 713AD and the loss of Granada in 1492. Murcia itself was occupied by the Moors until 1243 when it returned to Christian control as part of the reconquist, although many Moorish farmers chose to remain in their homes for several hundred years more. Despite the fact that rice was introduced into Spain by the Moors, in Calasparra there is no documented evidence that it was grown until the 17th century, although it is possible that there would have been some type of rice cultivation so close to the waters edge. However, only the stone remains of the settlement attest to the Moorish presence and following their disappearance from Calasparra, there was a brief period of abandonment before Christian families were brought in to re-settle the land and resume agricultural activities. There is no mention of any irrigation network using the water from the River Segura in the town charter of 1412-14, by which the Prior of the Order of San Juan de Jersualén ( Click Order of San Juan de Jerusalén ) allowed the Governor of Calasparra to distribute the land among fifty families who arrived to repopulate the area. Only when note is made in the 17th century pertaining to modifications of the irrigation channel of Rotas in order to grow rice, is there any written acknowledgement of the presence of the crop here. In the 18th century the system used for growing rice in Calasparra was perfected. The crop spread throughout the flood plains of the Segura, but when it reached the land near the River Argos the prevalence of mosquitoes brought about frequent and highly virulent malaria epidemics during the second half of the century. As a result the population fell, and the Town Hall had to forbid the growth of rice too close to the town on various occasions. However, over and again the prohibition was disobeyed. The worst outbreak of malaria was in 1804, killing many of the townsfolk, and after this the rice-fields gradually drew away from the town centre towards the lands closer to the River Segura. Calasparra branding and production of Calasparra rice. The production of rice in Calasparra and the brand name was protected by a Royal Decree dated 1st February 1908, which defined and delimited the rice-growing area to three municipalities. 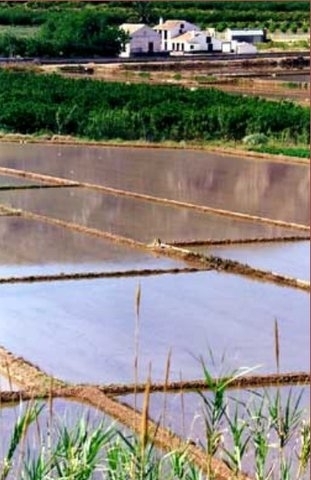 Of the 875 hectares now being used to grow rice, 425 are actually within the boundaries of Calasparra itself, the rest being divided almost equally between Moratalla and Hellín (which is in the province of Albacete). The originality and quality of the product is the result of two main factors. The first of these is the natural environment in which it is grown, with the rice-fields being located at an average height of 450 metres above sea level, and the water provided by the rivers Mundo and Segura. The second factor is the traditional methods used in production, the origins of which are lost in pre-history. Essentially the production cycle can be divided into four phases, which are land preparation, sowing, hoeing and harvest. Calasparra rice is grown not in stagnant water but in the water from the river, which is used by means of centuries-old methods to flood the channels in which the plants grow. These are on different levels, and are joined by a series of other channels, which mean that the water is constantly being replaced and renewed. At the same time the exact water level required is maintained at all times, and any excess water is funneled off into the river again. The plants are not introduced once they have already started to grow, but rather the seeds, having been moistened to ensure that they don’t simply float away, are scattered randomly on the flooded channels, with most of the sowing carried out by hand. Prior to this the channels are adequately prepared with nutrients to ensure the best plant growth possible. Rice crops are rotated with others in order to avoid deterioration of the soil in which they grow. In Calasparra crop rotation is over a cycle of two years, with rice grown from May to October, wheat from November to the following June, and beans and other vegetables from July until April, allowing the rice to be planted again in May. After 2 years the field is rested for a year to give the soil chance to recover. The ecological system in the rice-fields is seen as extremely important, due especially to the fact that the use of chemical plant food, herbicide and pesticide is avoided. This allows a perfect environmental balance and complete respect for the flora and fauna which exist alongside the rice itself. Product quality is guaranteed by the Regulation Committee of the Denomination of Origin, which was set up provisionally by the Ministry of Agriculture in 1982 before receiving full recognition in 1986. The varieties of rice grown are Balilla x Sollana and Bomba, since these are the ones which best adapt to the special characteristics of the Calasparra rice-fields. The grains take longer than many others to mature, due to the altitude, the temperature and the purity of the water, but this longer maturation period is what gives the product its unique properties and mark it out from others available on the market. Bomba rice from Calasparra is sold as “white”, while Balilla x Sollana is sold as “white”, semi-integral” or “biologically integral”, ie brown rice. Bi-products from rice production, such as the husks, bran and germ, are used in products ranging from foodstuffs for human consumption to the fermentation of liquor, and even the straw of the plants is used in other processes. 95% of the rice produced in the area is processed and marketed by the Cooperativa del Campo “Virgen de la Esperanza”, based in Calasparra. 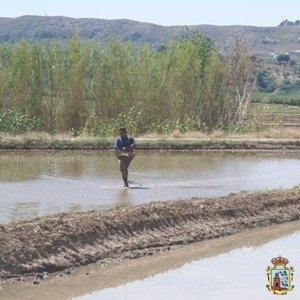 This cooperative consists of 160 members, who produce rice in an area of 450 hectares on the flood plains of the Segura and its main tributary on the left bank, the Mundo. Producers from all three of the municipalities mentioned above are included.